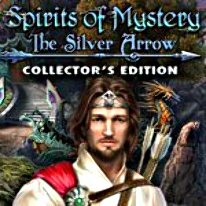 Discover your true destiny in Spirits of Mystery: The Silver Arrow! When you met Prince Philip, it was love at first sight... but his obligations to his kingdom kept you apart. Tradition required Philip to let Fate choose his bride by shooting a magical Silver Arrow into the sky. As luck would have it, the Silver Arrow chose you! But the moment it landed at your feet, a notorious shape-shifter appeared and took it away from you! Now you must track him down and get back the arrow before his mysterious client can get her grubby hands on it and present it at the wedding. Will you make it in time? Find out in this exciting Hidden Object Puzzle Adventure! -A bonus game where you explore the amazing world of the griffins!